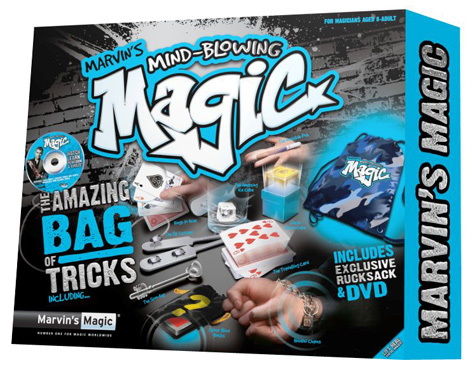 Budding magicians aged 8 and over can't help but love the Amazing Bag of Tricks from Marvin's Magic. The set consists of a high-quality shoulder bag jam-packed full of the coolest magic tricks around. From amazing card tricks to miraculous mind reading stunts, this set provides a brilliant introduction to the incredible world of magic. All tricks have been created to acheive maximum astonishment and fun for the whole family. The Amazing Ice Cube, The Travelling Card, Houdini Chains and The Invisible Pen are just some of the tricks included. All are explained in the accompanying DVD which will help you perform the tricks to maximum effect. Please tell us what you think of the Amazing Bag of Tricks. This is ideal for any child who would like to learn about magic tricks. The DVD is useful as they can watch it over and over again until they get the hang of it. There are lot's of different tricks to learn so it will keep them busy for hours!